The concept of harnessing the wind to provide a large portion of our energy sounds like an ideal answer to our concerns about the damage to the environment from obtaining and burning fossil fuels. As well as being a clean renewable energy source, it seems as though wind farms should also be aesthetically pleasing with silently rotating blades reminiscent of a rural Netherlands landscape. However, our initial, naive concept of wind power did not foresee the magnitude of the development of commercial wind power or the major issues that could negatively impact the surrounding environment including birds, animals and our own homes and neighborhood. Commercial wind farms stretch across the countryside for miles with modern wind turbines that are gigantic in proportions. The immense scale is beyond anything we ever imagined. The turbine height can be 400 or more ft - the approximate height of a 40 or 50 story skyscraper. The diameter of the rotors on a 400 ft turbine is 290 ft - almost the length of a football field. The rotor blades weighing more than 7 tons are marked with flashing lights and can spin at 200 mph. Because of their size and numbers, the lighted wind turbines become the dominant visual aspect of the landscape as far as the eye can see, destroying any natural scenic beauty by day or night. And on sunny days, the spinning blades cause shadows and blinking strobe-like effects to sweep across the land on grazing cows, on children playing, and through the windows of our homes. Constant low frequency sounds are emitted by the spinning rotors creating significant levels of background industrial noise pollution as far as 3,000 feet away. The sound has a pulsing character caused as a wing passes the turbine mast. When several turbines operate nearly synchronously the pulsing greatly increases in magnitude. The sound resembles "pile driving or an endless train." As the wind changes directions the blades' angle must be adjusted, which creates a loud grinding noise. If the wind becomes too strong the blades' rotation must be stopped, resulting in a screeching sound similar to that of a train stopping. That same loud screeching occurs when the blades are restarted. Wind turbines can cause interference with radio, television, and microwave transmissions and reception. There is a danger from stray voltage, increased lightening strikes, and an increased fire hazard. In addition, wind farms create a loss of habitat for wildlife and the turbines can kill birds through collision and electrocution. Unfortunately, the heaviest hawk and songbird migration often takes place above high ridges, lake bluffs, and lake and ocean shorelines which are also ideal locations for wind farms. The wind turbines at Altamont Pass in California kill on average a thousand raptors every year as well as several thousand smaller migratory songbirds. Even migratory bats are victims. At Backbone Mountain, West Virginia 4,000 migrating bats were killed in a single season. Even though modern commercial wind farms can only provide enough power to supplement traditional power plants and will not eliminate our need for oil or coal or nuclear fuel, they are now rapidly being constructed across this country with help from government funding. Wind farms are being planned for areas particularly well known for bird migration such as Cape May, New Jersey, the Gulf coast of Texas, and the lake bluffs and mountain ridges of Pennsylvania. With the passage of Pennsylvania Governor Rendell's Growing Greener II initiative, $80 million over four years will be provided to expand the grant program earmarked for wind energy in the state. Commercial wind energy companies, such as Gamesea, have already approached Pennsylvania state agencies to consider the construction of thousands of wind turbines on state forests, state parks, and state gamelands. Trees must be cleared for roadways to the tower sites as well as a very large area surrounding the base of each tower. In some areas, bedrock will need to be blasted through for each tower's substantial foundation. Public input is needed to be sure that wind power developers locate commercial wind farms on sites where the turbines will not have a significantly negative impact on wildlife, migratory birds, residential areas, and scenic views. We need to keep alert before deals with developers are made.Participation is needed in your township or city council meetings where zoning regulations for siting wind turbines should be made. And write to your state legislators regarding state-owned lands NOW before it is too late. 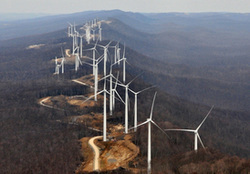 For current issues on wind energy see the National Wind Watch website at www.wind-watch.org. Read the following letters (in PDF format) written by people who live near wind farms. According to Scott and his contacts, the gas industry is pulling out all the stops to push their agenda through the passage of this bill including withholding funding to representatives that won’t agree to vote for the bill. This bill is said to be perhaps their biggest priority and they will make those who oppose it pay a price. At the time of this writing, we are 10-15 votes away from stopping the passage of this bill and even representatives who said they were against it may be reconsidering in the face of threats from the industry. We cannot let this happen for the sake of Pennsylvania’s wildlife and natural ecosystems! If you do not want to see this bill passed please contact your legislators!! If you’ve done so already, do it again by email or phone just to let them know you’re touching base and keeping track. My own representative is actually a co-sponsor of the bill, but I have written him again letting him know in no uncertain terms my opposition of the bill and that I will not only speak through my letter but also through my vote. On November 13, 2013 the following amendment to HB 1576 was proposed and approved by the Game and Fisheries Committee: Amends the definition of "acceptable data", "person" and "centralized database", removes the 2 year requirement for redesignation of currently listed species, amends public dissemination requirement, increases civil penalty for unlawful use of information, clarifies that licensing money may not be transferred to another agency for implementation of the act and makes additional changes. The committee also voted on the bill and it passed within the committee as amended by a margin of 16/8 with one member not voting. The bill will now be brought to the full house for a vote in the future. It was my hope and the hope of many conservation and environmental organizations thatthe bill would die in office but it did not so our work is not yet done. I respectfully ask that you contact your representative either by phone, letter or email and ask that they vote “No” on this bill. - This legislation fixes a problem that does not exist. Regulatory action to list a species as threatened or endangered is already an infrequent and deliberative process and requires scientific data from agency biologists demonstrating that a species is in imminent danger of extinction throughout their range in the state. - Currently the listing and delisting a species by the PGC is a process that is already transparent, takes approximately six months to complete and includes two periods of public comment and two separate votes by the Board of Commissioners. - Requiring the listing of a species to go through the IRRC approval process will add months - and potentially years - onto the process and result in added layers of inefficient bureaucracy. - This legislation will have the opposite effect of its intended goal. State endangered species programs serve as a first line of defense in protecting species not yet federally listed. One of the criteria the FWS evaluates when determining whether to list a species as federally threatened or endangered is the "adequacy of existing [state] regulatory protections." Slowing down the process whereby state resource agencies can list species will force the FWS to take a more active role in designating species. Thus, instead of having minor, temporal restrictions placed on the state level, entities will have to deal with more onerous restrictions imposed by the federal government which will exist for a longer period of time. - The natural resource agencies already maintain a database on the location of threatened and endangered species in the Commonwealth. Information on that database is shared with outside entities when needed in order to protect and preserve those species. Increasing access to that database will increase the risk of unlawful taking of threatened and endangered species as many of those species have substantial value on the black market. This legislation would require the natural resource agencies to provide a virtual roadmap to the location of species that are often targeted for illegal sale and trade.